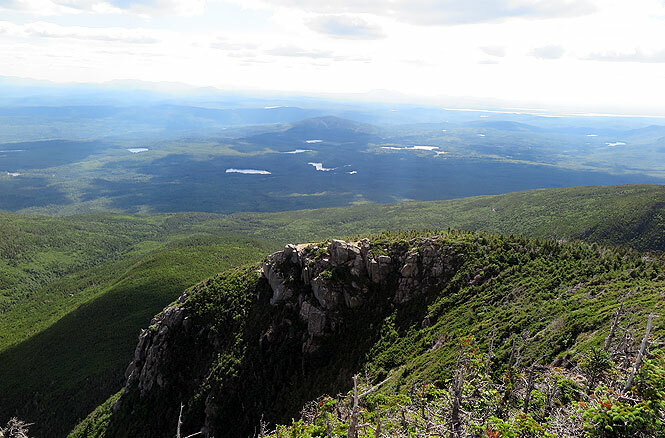 As the closest mountain on the western side of Katahdin, The Owl has a front-row seat to the best show in Maine’s Baxter State Park. 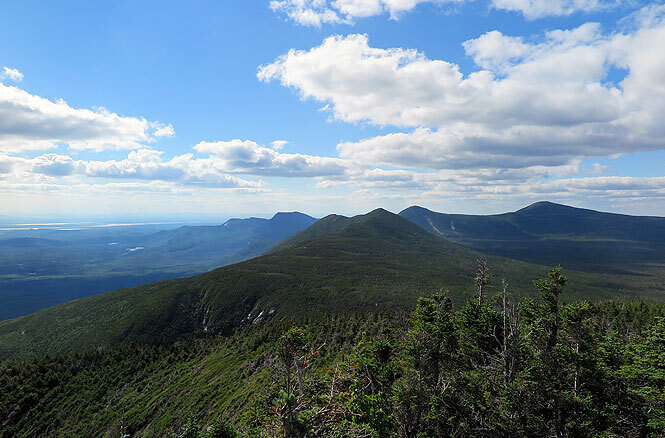 And yet, The Owl Trail hike is often overlooked or “saved for another day” by those looking to bask in the glory of Katahdin. I’ve been one to skip past The Owl and let me tell you, missing out on this hike is a mistake. 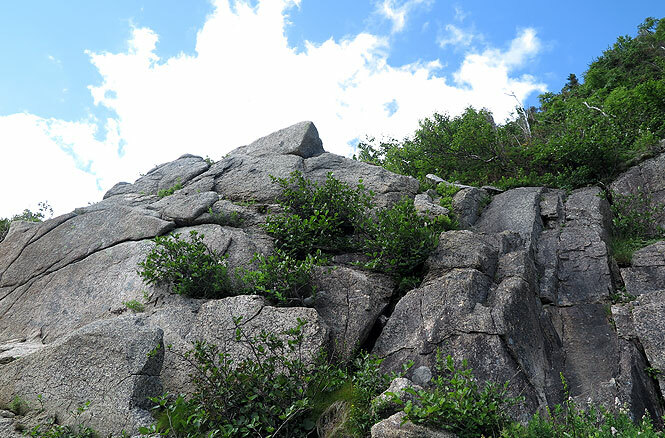 As if possessed by the same grit and determination of a younger sibling, The Owl features steep rock scrambles and bouldering that screams Hey, I’m tough, too! The views, well, they speak for themselves. 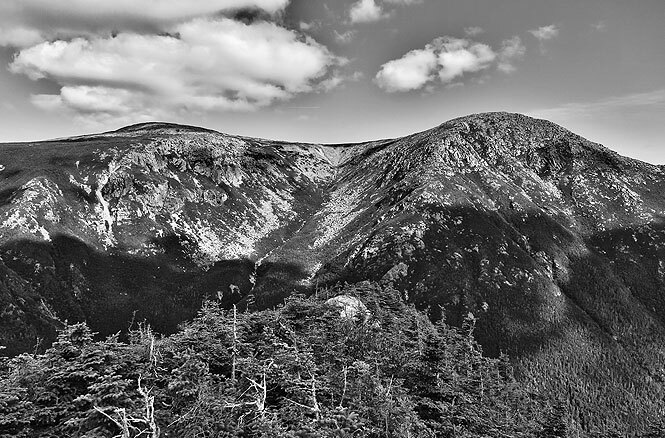 The Owl as seen from the Hunt Trail/Appalachian Trail’s ascent of Katahdin’s Hunt Spur. 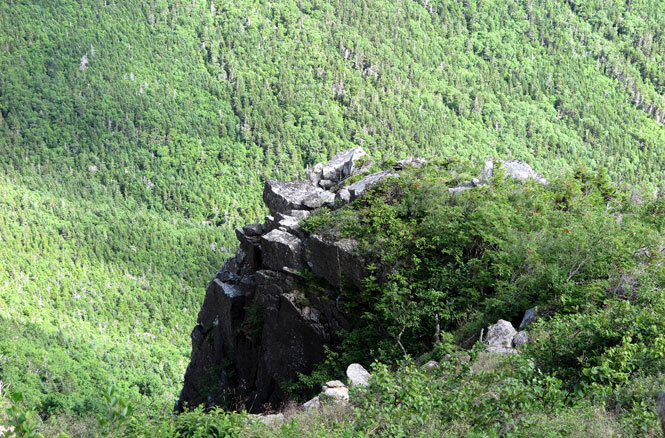 From this angle, you can see the outcroppings that lead to the summit. 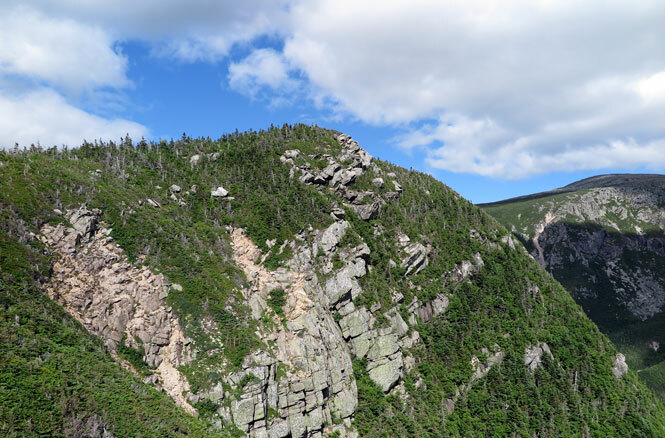 Viewed from Katahdin Stream Campground, this profile resembles a Great Horned Owl, for which the mountain was named. 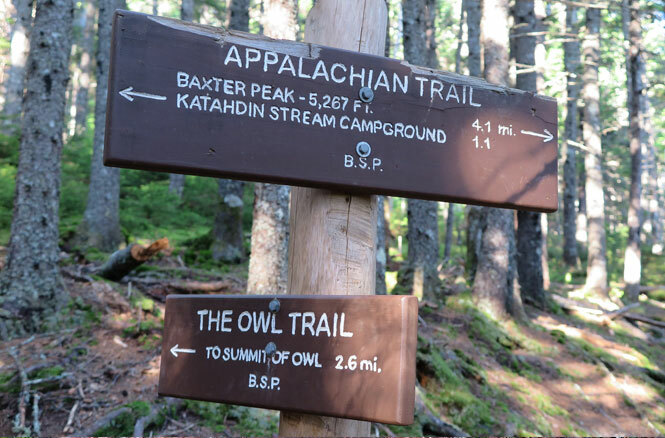 The Owl shares the same parking area and trailhead as Katahdin’s Hunt Trail at the Katahdin Stream Campground, which means camping reservations or a day parking pass (not needed if you’re camping in the park) must be booked months in advance. We made room in our itinerary for The Owl by arriving early enough the day before our Katahdin adventure to complete a warm-up hike. 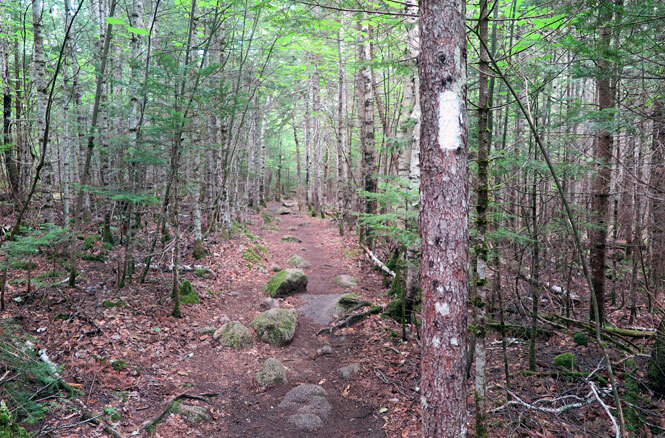 The Owl hike begins with 1.1 miles on the Hunt Trail/Appalachian Trail, an easy walk paralleling Katahdin Stream that slowly begins the climb. 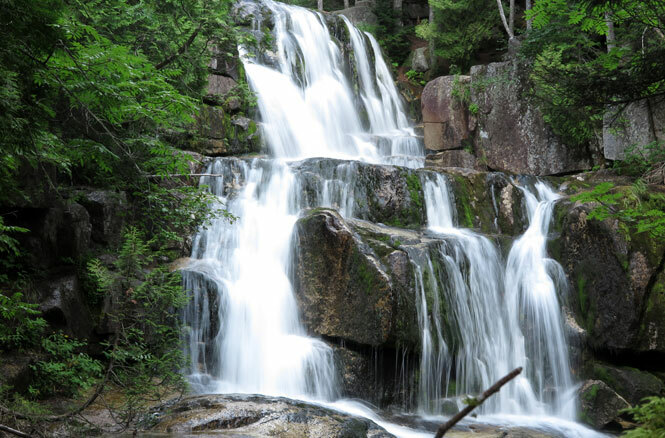 If you aren’t planning to hike Katahdin via the Hunt Trail during your visit, it’s worth continuing past The Owl Trail junction to see Katahdin Stream Falls. I don’t know the exact distance from The Owl trail junction to Katahdin Stream Falls, but it’s probably not more than 0.3 miles. 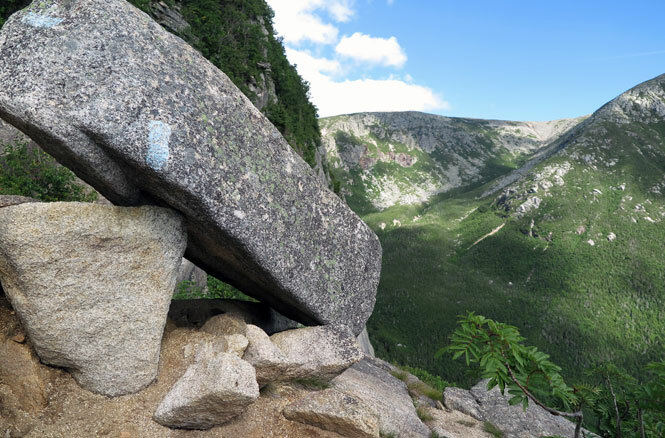 From the intersection, the Hunt Trail crests a mound, crosses a footbridge over the stream, and then scrambles up exposed granite above a gorge. A short spur trail descends a steep bank to a viewing area below the falls. 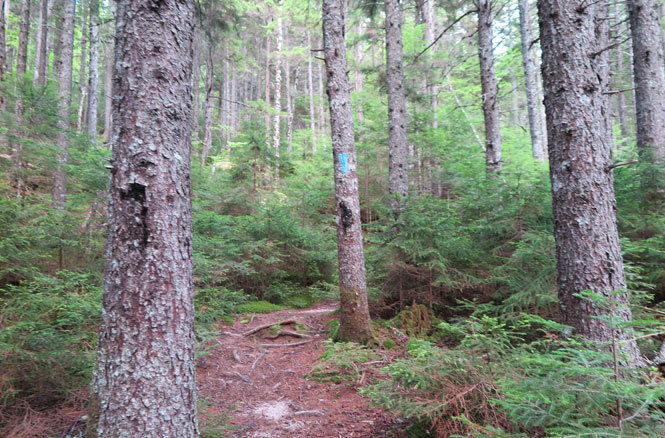 Back at The Owl Trail junction, the blue-blazed hike begins with a moderate climb through a coniferous forest. 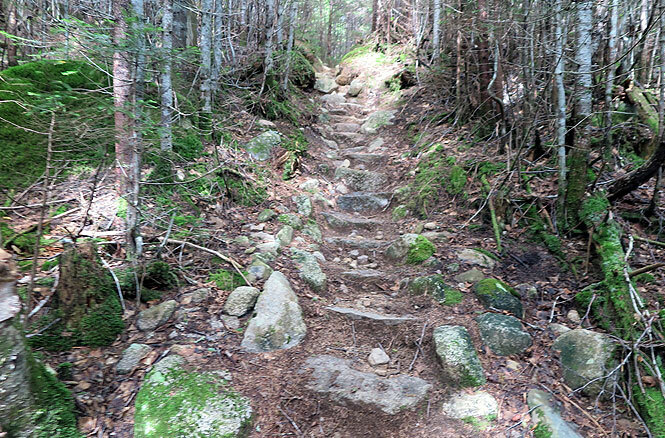 After a while, the trail crosses a Katahdin Stream tributary (rock hopping possible at times of lower water levels) and flattens out for a stretch. Enjoy the flat-ground hiking while it lasts because the climbing is about to get real. The Owl Trail begins to work the quad muscles with routine steps. 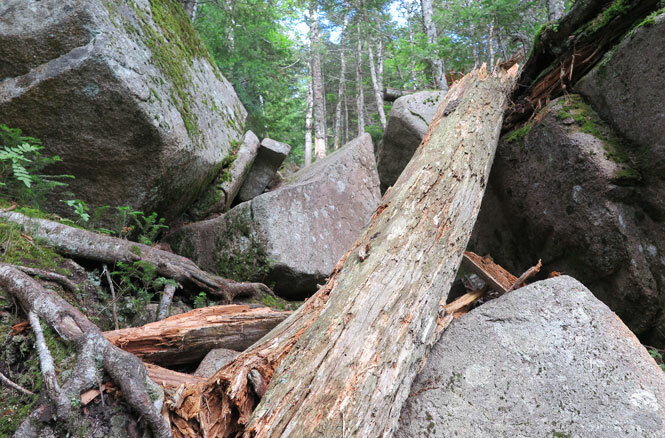 Then the rocks get bigger and disorganized as the trail ascends a ridgeline with occasional glimpses of the Hunt Spur on Katahdin. 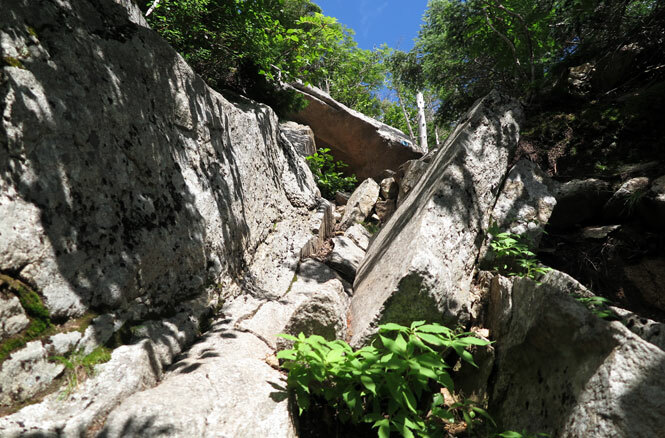 The trail emerges onto an outcropping along the 500-foot Owl cliffs. 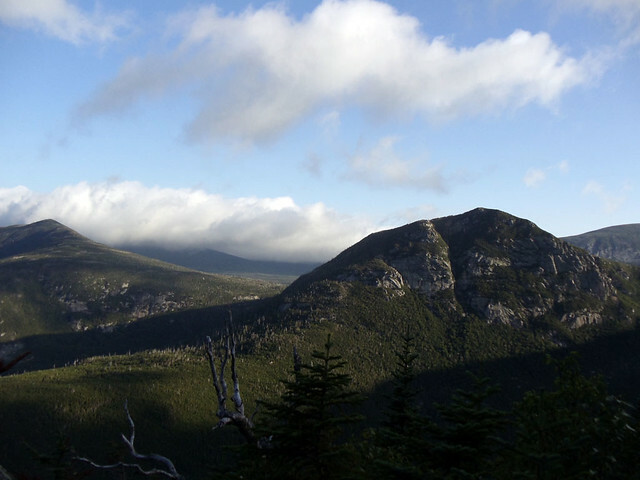 From here the view is completely open across Witherle Ravine to Katahdin’s Hunt Spur. A glimpse of the first outcropping from above. Bob Ross might as well have created The Owl in one of his paintings because the first outcropping has friends, providing plenty of rock scrambling fun before reaching the summit. I told you so. Just sayin’. 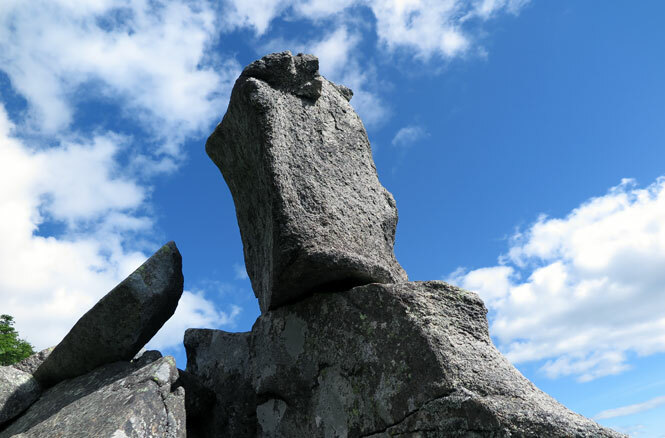 The Owl Trail emerges onto another shoulder of the mountain where this sentinel boulder stands guard. 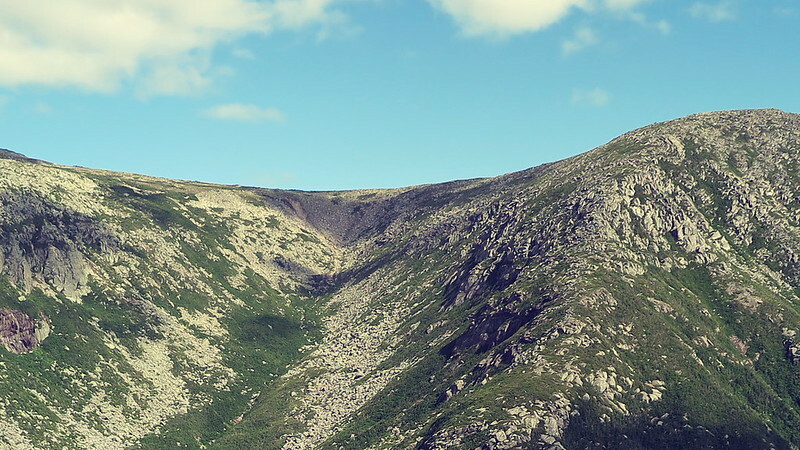 A closer look into Witherle Ravine shows the origins of Katahdin Stream and the upper Katahdin Falls. From this shoulder, the Owl Summit is within view, and the challenging climbing is complete. 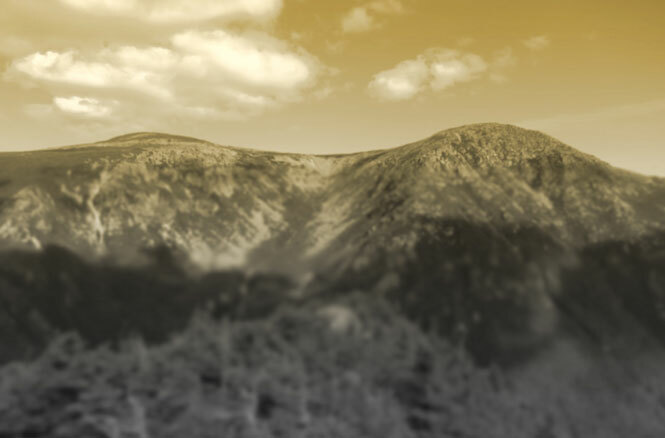 The view of Katahdin from The Owl’s summit. 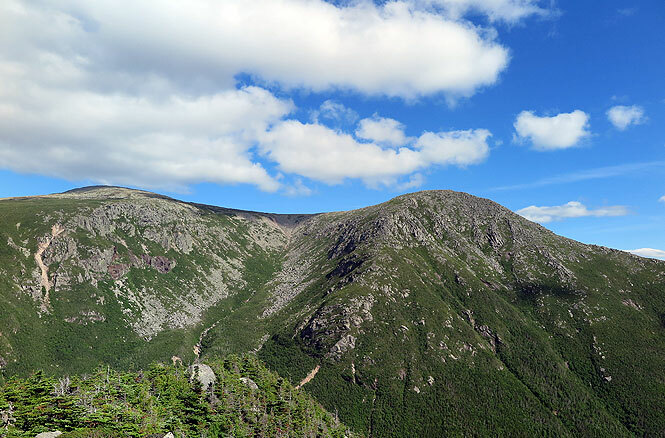 In New England, mountain landscapes don’t get much better than this. Looking down upon the outcroppings whence the trail came. The Owl’s view of Barren Mountain. Now some fun with the camera filters. I thought this sepia version looked cool. And why not a nostalgic version for good measure?